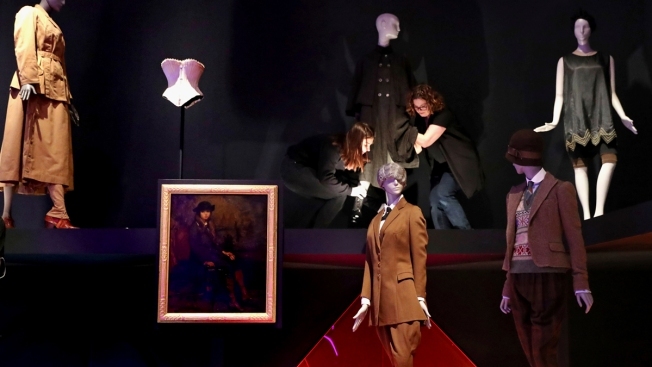 Workers install a mannequin wearing clothes that combines traditional designs for men with those for women, for the "Gender Bending Fashion" exhibition at the Museum of Fine Arts in Boston on March 14, 2019. Porter, the black and gay breakout star of the FX series "Pose," had bucked traditional Academy Award attire -- fancy frocks for the ladies and basic tuxedos for men. "Gender Bending Fashion" is the first large-scale exhibit of its kind to be hosted by a major museum. It is comprised of mixed-media: paintings, record covers and photographs. But a highlight for viewers will surely be the 70 gender-bending ensembles from big-name designers, such as Rei Kawakubo, of Comme des Garcons, and Walter Van Beirendonck, a member of the influential avant-garde group "Antwerp Six." In the 1920s, women secured the right to vote and started working outside the home for the first time. The 1960s brought the sexual revolution, gay rights and second-wave feminism -- people pushing back against traditional roles.